For the tarot meditation of the Chariot card upright, you will take and put the candle in front of you, the chariot card upright on a copper cloth. As you settle down think of victory, accomplishment, and overcoming victory. The king or queen reigning supreme, over-seeing their people. As you slip down into the meditation, you will begin to hear the creak of the chariots wheels, feel the rumble of it as it races across the ground at high speed. The Chariot charges across the landscape, the land around you is smoking from the wages of your war, you rapidly steer your chariot past obstacles, dodging trees and fences. You cleave down enemies as you pass, and charge towards your goal waiting ahead. With a quick turn you start bearing down on a bridge deep in flames, you can see it nearing collapse but you must cross! What you seek is on the other side! You whip the horses into a fervor, and charge the bridge. You feel the structure of it crumbling beneath your wheels, hear it collapse behind you, but it doesn’t matter! You are across, your goal is in sight! You plow through the remaining obstacles with a victorious roar and grab the object of your victory! It is yours! You swing the chariot around to see those who travelled with you behind you, roaring your success. The environment shifts, and you are now parading down a pathway in your clean chariot, your clothes are pristine, bearing the mark of your newest victory. The people are cheering and throwing ribbons and chanting your praises! This is your victory, your goal! This is what you sought and you have achieved it! Now is the time to enjoy it, settle in and relax. The time for action is coming, but it has now passed. Allow this to be a time in and of itself, separate from what came before, and what is to come after. Ever moving forward, ever towards victory, that is what you have been doing, and that is what you have done. Revel in this feeling, know how it feels, and be part of it. 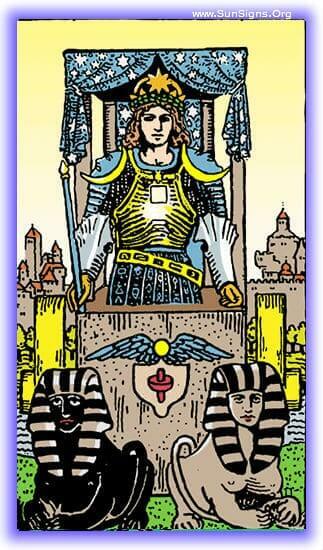 This is the influence of the tarot meditation on the Chariot card upright. As you come out of the meditation, remember that feeling and any imagery it brings with you. Record it in your journal, extinguish your candle, and place it aside.